The Morandi Bridge was severed in its midsection during a heavy downpour Tuesday. Government officials initially said 39 people were killed but revised the death toll to 38 on Thursday. 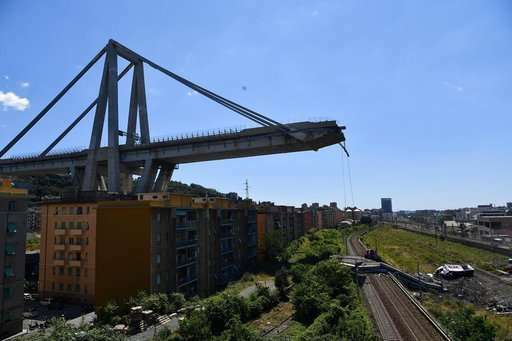 Italian prosecutors focused their investigation into possible design flaws or inadequate maintenance of the bridge that opened in 1967. Most recently, a 20 million-euro ($22.7 million) project to upgrade the bridge's safety had been approved before its collapse, with public bids to be submitted by September. According to the business daily Il Sole 24 Ore, the improvement work involved two weight-bearing columns that support the bridge—including one that collapsed Tuesday. Matteo Pozzi, an associate professor in the Department of Civil and Environmental Engineering at Carnegie Mellon University, said the bridge in Italy "was known to have problems," as evidenced by the upcoming upgrades. But he said older bridges can often be sustained with maintenance and repairs—and collapses are rare. Of the bridge's design, Hawkins said the concrete encasement improves the anchorage of the cables but "in a marine environment there can be a buildup of chloride in the concrete and that can lead to cable corrosion." He said any broken cables would have to be examined to determine whether that was the case in the Morandi bridge.